Today Facebook announced three new changes that empower its users with significant real time communications features: Group Chat, a site redesign and Facebook Video Calling powered by Skype. For Skype it’s a major awareness builder of the power of video calling. As suspected by the inclusion of new Facebook features in Skype 5.5 beta for Windows released last week, Skype is working on a long term partnership with Facebook to integrate Skype technology into the Facebook platform. Facebook chat support in Skype 5.5 beta for Windows followed by today’s Facebook Video Calling announcement is just the beginning to build a real time communications user base beyond the current Skype user base. From the Facebook viewpoint Facebook Video Calling offers a new real time social networking application built around Facebook’s social networking architecture. Facebook CEO Mark Zuckerberg mentioned that this is the first of many “applications” where Facebook wants to partner with a provider who has a focus on the relevant area of expertise required to offer a quality service while not having to invest in the development of the particular expertise. Facebook Chat sessions are being mirrored on the Facebook Contacts tab in Skype 5.5 beta for Windows. Entries in either chat window will show up in the other one. There is no “setup” required to launch a video call beyond a one-time initial installation of a plugin (Windows, Mac). On Windows the plugin installs as a Program that can be uninstalled in the usual way. While there are options during the call to change the mic/speakers and webcam, there are no settings for volume or testing the audio/video hardware. And there is no way to see Call Technical Info. It’s a total focus on a simple user experience. A Facebook Video Chat is launched by going to a Friend’s page on Facebook and clicking on the Call button. 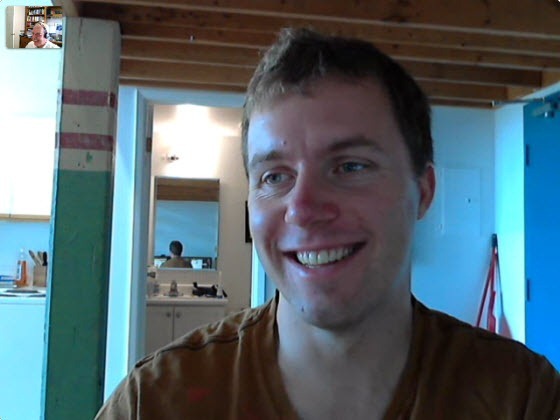 If a Facebook user does not have a webcam a voice call is fully supported with your Facebook avatar/profile picture replacing the video image. While you hear a “ringing” sound when someone calls, it is not obvious where the “answer” window is. On the first call to me I had to minimize three or four other windows to find the “answer” window. When a video message is sent (option if there is no answer to the video call), it is not obvious to the recipient that a new message has been received. To find the message one must go to the Message icon on the left side of the Facebook ribbon bar and select the “Friend” who has sent the message. When someone started a Facebook chat session with me, the only way I knew that this session had started was to see a new message notification in my Skype 5.5 beta for Windows client. There was no notification on my Facebook site. Video is 640 x 480; however, there is no frames-per-second information available. This Facebook-Skype partnership had been seeded prior to Tony Bates’ appointment as CEO last October; however, he has certainly endorsed it. Prior to the public announcement of Microsoft’s forthcoming acquisition of Skype, he went with Microsoft CEO Steve Ballmer to inform Facebook CEO Mark Zuckerberg of what would be announced later in the day. Both Facebook and Skype see this as an opportunity to build video calling experiences across the Facebook user base prior to launching paid services such as outbound calling to the PSTN and Group Video calling from Facebook. I’ll continue to use Skype for its higher quality video and its auxiliary services such as group conversations and file transfer. However, if someone wants to communicate via Facebook, it’s a reasonable alternative – provided I get appropriate and timely notification of a conversation request. The real target user for today’s announcement are all those multi-millions of Facebook users who have never experienced using Skype for their real time communications activity; an easy-to-install, ad hoc offering is more appropriate to them. 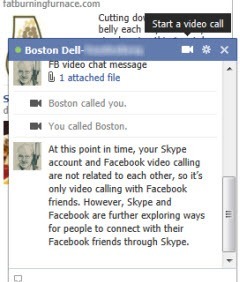 In the end both Skype, as a service, and Facebook will find there relative niches. Full disclosure: I received one of those Google+ invitations that Google could not fulfil on, so there is no Google+ experience reflected here.